Trey Songz is a charming, unassuming, and friendly. He’s also confident, polite and while engaged in conversation he never breaks eye contact. He says thank you, a lot and listens very, very well. In New York City last month to talk about his new starring role in the independent film “Blood Brothers” I sat down with Songz, interviewing him inside his powerful publicists (PMK) office. He’s taller than I imagined. Dressed for warmth in a long, black bomber coat when I walked into the room Trey was reclining (and smiling) on the office couch and there he stayed, for the duration of the interview—utterly relaxed and charming. This is the very first time that I've interviewed an artist while they reclined as if they were at their therapist office, and I asked the questions with the same, measured tone of an experienced analyst. 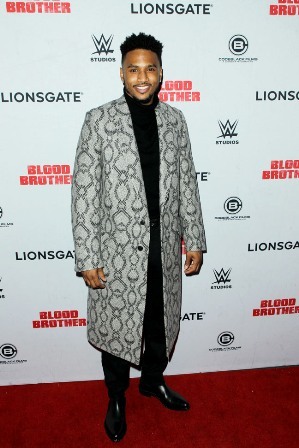 Trey Songz laughed, a lot and once I assured him he did not have to get up or even sit up, he settled down (all smiles) and talked about his new role in the indie film “Blood Brothers” which is as a story of revenge. Packed with blood pumping action, “Blood Brothers” is the story of an ex-con who takes up a vendetta against childhood friends whom he believes let him take the fall for a crime that they committed together. One of the friends, now a cop, risks his life to stop him. Along with Songz is actor Jack Kesy (“Deadpool 2”), China Anne McClain (“Black Lightning”), Hassan Johnson (“The Wire”), Tanee McCall (“Burlesque”), and introducing top-selling music artist Fetty Wap. Trey Songz was born on November 28th. His legal name is Tremaine Aldon Neverson and he’s more than a triple threat. 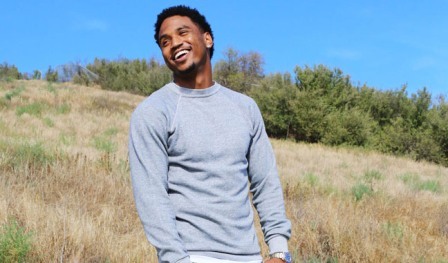 Songz is a singer, songwriter, record producer, rapper and actor. His debut album, “I Gotta Make It,” (2005) was followed by “Trey Day” which landed him his first top 20 single, “Can’t Help but Wait.” The third alum (2009), “Ready,” and the single “Say Aah,” peaked at No. 9 on the Billboard Hot 100 making it Songz’s first top 10 hit.Ready was nominated for Best Male R&B Vocal Performance at the 2008 Grammy Awards. More hits followed and in 2014, his sixth studio album, Trigga promoted by the top 40 songs, “Na Na” and “Slow Motion” took him over the top. According to the data, he has sold over 25 million records worldwide in singles and albums. Songz’s latest musical project seems likely to help stay on a winners streak. On November 28 he dropped a pair of new mix-tapes in honor of his 34th birthday. 11 and 28 both hit streaming services without any type of warning from Trey which gave him “an exhilarating sense” embracing the unexpected. Here is an edited one-hour interview with musician/actor Trey Songz. Trey Songz (TS): Lapacazo, do you want me to sit up? L.A. Watts Times (LAWT): Absolutely not! You stay right where you are! TS: I like your hair! How you doing! LAWT: Thank you, I’m doing fine! You look comfortable and ready to talk about your brand new film. So, tell me, in your opinion what’s the underpinning theme of “Blood Brothers”? TS: Brotherhood, definitely. You know as much violence as there is in the movie, it’s actually about love. My character [Sonny] has to make a lot of hard decisions because of love. I think that he has loyalty to things he doesn’t really understand. There comes a time when a friendship has to play a back seat to family. [Sometimes] you have friends that want to pull you into directions that you don’t want to go. And there comes a time when a debt is paid, as well. LAWT: So, I understand that you initially turned down the lead role in “Blood Brother” if this is true and if so, what made you finally say yes? TS: True because [at the time] I was so focused on music but the director [John Pogue] was so passionate. We had a two- hour conversation that changed my mind. As an artist, I get a lot of opportunities that actors don’t get and I never want to disrespect that. I wanted to have the time to focus just on my role in the movie. John is a great director. He puts the biggest battery in your pack and then he has a reality check with you. LAWT: I also understand that you worked with an acting coach? So you take the art form seriously? TS: Absolutely true and yes, I do. I had the acting coach come down [New Orleans] and we worked out, for hours every day. Just her and I. Then [later] we would meet with the director. I wanted to be well prepared. LAWT: What do you love about acting? TS: That I can do it, forever. LAWT: What do you love about making music? TS: I was just talking about this with someone the other day. [Music] It’s the universal language. It correlates everything with life. Music is everywhere. It’s the only thing that everybody likes. LAWT: I know a storyteller, a writer when I am talking to one. Are you working on a screenplay? TS: Really? Well … actually…I use to write poetry and short stories before I started writing music. No screenplays … yet. LAWT: “Blood Brothers” was shot in New Orleans. Did anything creepy happen? The city does have a supernatural history? TS: No, but I was there during Mardi Gras and where I was staying, was the exact location for all of the bands to start [the parade]. I woke up and it was like 400 musicians warming up. I walk outside and there are school buses everywhere and there are school children, everywhere. I’m half asleep and everyone is turned the opposite way then I grabbed my dog and I ran. Drums, horns, everything for two weeks. Early in the morning until late at night, surreal. I wasn’t even mad. I was just like: wow, I am living in the heartbeat of the city. LAWT: Did you mention that you had a dog? TS: Two dogs. They are french bulldogs. LAWT: I love that breed. I don’t think they are ugly. I think they are cute! TS: (laughing) [mimiking] ‘I don’t think they are ugly, I think they are cute’. You are funny! They are cute, to me too. LAWT: What’s next for you Trey Songz? TS: (laughing) Oh, I just dropped a couple of mix-tapes on my birthday!